Self-sealing pouch with color sterilization indicator for use in any steam sterilizer or Autoclave, manufactured using medical-grade Kraft paper and transparent polypropylene/ polyester laminate film. The combination of sufficient width self-sealing strip and a perforated fold gives a clean, uniform fold and thereby create an effective seal. Designed critically to maintain sterility of the contents until use. Self-seal connecting pouches gives an advantage when a group of instrument are to be kept together. Manufactured using medical grade paper and polypropylene/ polyester laminate transparent film. The combination of different width self-sealing strip and a perforated fold gives a clean, uniform fold and thereby create an effective seal. Designed critically to maintain sterility of the contents until use. 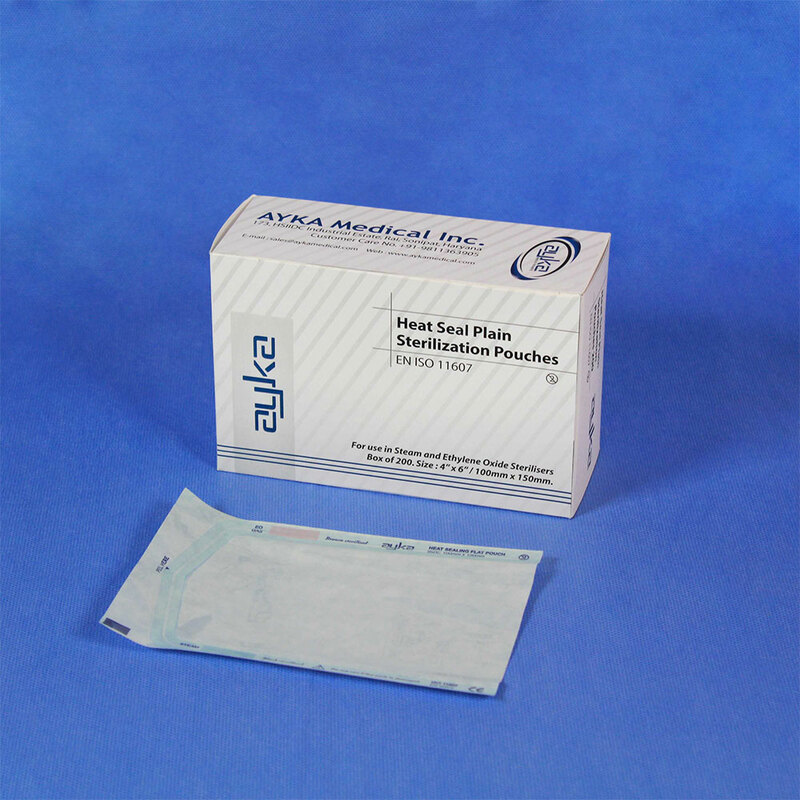 Heat sealing pouch with sterilization indicator to be used in any type of sterilization process are manufactured using medical grade paper and polypropylene/ polyester laminate transparent film. The combination of different widths developed for preferential performance and offered according to the superlative strong quality controls, for optimized sterility solutions. Heat seal connecting pouches gives an advantage when a group of instrument are to be kept together. Sterilization indicator used in sterilization process are manufactured using medical grade paper and polypropylene/ polyester laminate transparent film. The combination of different sizes developed for preferential execution and offered according to the strong quality controls, for optimized solutions. Tyvek® Pouches are most commonly used by medical device manufacturers for packaging medical devices, pouches made of Tyvek® are used in healthcare settings to provide resistance to microbial penetration, helping in maintaining sterility of the contents. Tyvek pouches when opened generates very few airborne particles in comparison to medical grade papers.